Is this really a problem people have to deal with? 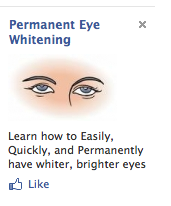 Not having white eye whites? And just as a side note: look at those eyes! Where is she looking? It's like she's got one wandering eye and something interesting is happening waaaaay above her but her head is strapped into some kind of Sawian torture device.